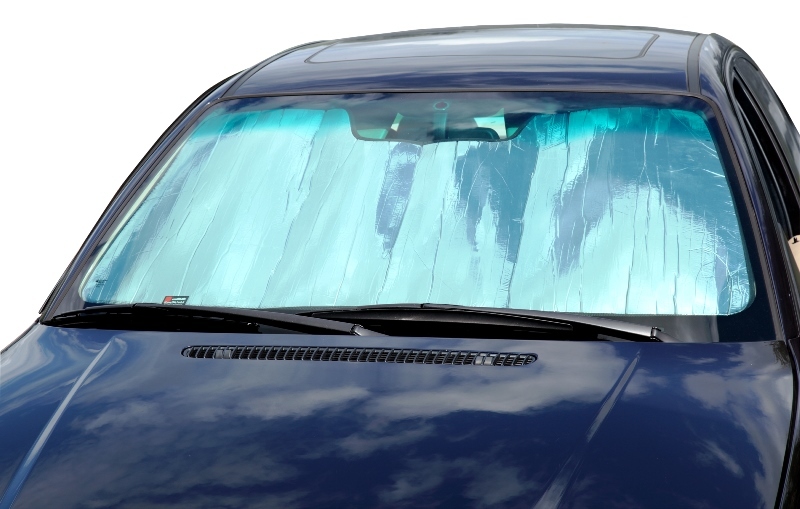 FlexShade Covercraft Custom Sunscreens for the Windshield - Flex Shade™ Sunscreen: ROLL UP TYPE. Custom patterned to follow the outline of the windshield. Covercraft roll up Flex Shade SunScreen. High performance radiant barrier material uses laminate construction with insulating foam and a clear mylar film on the inside. The side that faces the outside uses a metalized polyester laminate finish to reflect up to 97% of the sun's damaging UV rays. Reflectix Sun Shield Roll-Up Design are easy to use, just roll the shield into place and lower the sun visors. Lightweight material is easy to handle. Reduces interior temperature and protect your interior, seats and dashboard from Sun Heat & UV damage. Optional storage bag available.